The best mattress toppers will add a layer of luxury to your mattress, while protecting it too. They're great news if you don't have the best mattress: a quality mattress topper will give you a much better night's sleep. They're especially useful if you’re renting furnished accommodation, or need a short term solution before upgrading to a new bed and mattress. And if you've already invested in a decent mattress, a mattress topper will act as a mattress protector, keeping it safe from stains and giving it a longer life. In a similar way to pillows, mattress toppers come with a wide range of fillings. Memory foam mattress toppers are great for people who often overheat in the night; natural feathers are best for people who have joint problems; and synthetic fillings such as polyester, polyurethane and latex are the best option for people who have allergies. A good quality mattress topper can change the entire feel of your bed. It can make a mattress feel firmer and more supportive for back sleepers. For front sleepers, they can make a mattress softer, and for side sleepers a good mattress topper will create a comfort level somewhere in between. If you usually find yourself getting especially hot or cold during the night, a mattress topper with breathable memory foam can also help to regulate your temperature. Alternatively, if you're always cold at night, a goose down mattress topper is one to consider for winter months. So don’t lose another night’s sleep over it. Here are the best mattress toppers you can buy to help you drift off peacefully. The Eve mattress topper is designed to add a luxurious layer of comfort to your mattress. Apart from being extremely comfortable, its standout feature is that – unlike many other mattress toppers – it also provides “a generous helping of support” too. 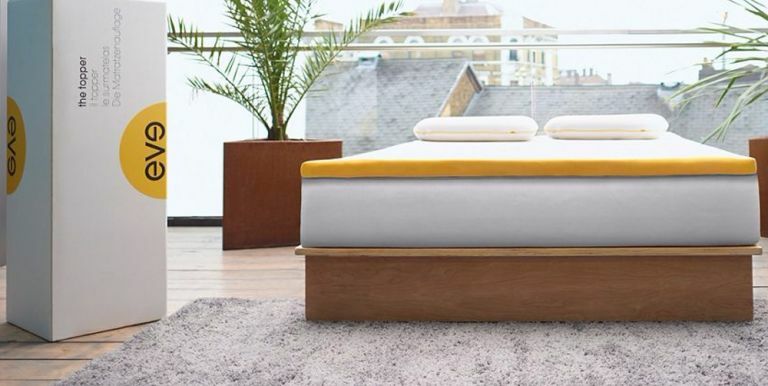 It’s made from 5cm of the same foam found in the company’s original mattress: there’s a 2cm open cell comfort layer, and a 3cm base foam layer for increased support. It also comes with a hypoallergenic, removable and machine-washable 100% polyester cover, which will increase its life. The Eve mattress topper comes with straps at both ends that hug your mattress, keeping it firmly in position as you sleep. The foam regulates your sleeping temperature, so you’ll stay cool throughout the night. It also serves to reduce motion transfer, which means you’ll notice less partner disturbance throughout the night. And its very breathable – in fact, Eve claims it’s around 30 times more breathable than traditional memory foam. It’s expensive compared to other products out there, but we think the Eve is the best mattress topper you can buy – it’s as good as a new mattress, for a snip of the price. If you want a mattress topper to keep you warm and snuggly when winter rolls around, then go for this Hungarian Goose Down Mattress Topper. It is extremely soft as well as supportive so it will help prolong the life of your mattress whilst bringing the added benefit of a bit of extra comfort. You can tighten or loosen this mattress topper with its adjustable buttons meaning that you can have it nice and taught if you like a firmer mattress or have it looser if you like a softer sleeping foundation, great for anyone worried that adding a mattress topper to your bed can negate the benefits of your carefully selected mattress. The top layer is easily removable and machine washable which is an added bonus if you want to get it washed and store it over summer. When you first get this mattress, give it time to air out and plump it up, as the feathers can become compressed when packaged. If you suffer with occasional back or joint pain, then this mattress topper could really make all the difference, especially if you have a pocket sprung mattress as this Silent Night topper works best with this type of base. The thick memory foam moulds to your shape when sleeping to relieve any pressure on the muscles and allow a soothing night’s sleep. If you’ve never had a memory foam mattress before, this could take a little getting used to as it can feel quite firm compared to a sprung mattress when you first try it. However, if you are looking to invest in a mattress topper because you've heard they can be good for relieving aches and pains; it's true, they can, and this is a very good quality choice. You're typically looking at over £100 for a mattress topper these days which can be quite off-putting if it's something you just want to try out or indeed something you are thinking of using in a guest room. However, with an RRP of £59.99, the Rejuvopedic Microfibre Mattress Topper takes a bit of the risk away. If you like the idea of the Hungarian Goose Down mattress topper further up in our list, but you or your partner suffers from allergies, then this microfiber mattress topper is a great allergy-friendly alternative. It is light and soft but still supportive and it's made with individual pockets meaning it is thick and full and does not require plumping like down does. As the cheapest option on the list, if you just need a short term solution for a guest bed or other less frequently used mattresses, this is the best mattress topper for anyone on a budget. For those with allergies, getting to sleep at night can be a nightmare, but with this breathable mattress topper you should be able to nod off in no time. Although thinner than others, this mattress pad protects against dust mites, allergens and bacteria making it the best mattress topper for allergies, asthma, kids and families with pets. 2cm may not seem like much, but the added layer can really make all the difference and will prolong the life of your mattress. It's not the fanciest or comfiest option on our list, however, it is most certainly functional and if you are worried about little ones with asthma that tend to get the sniffles in the night, give this a try. If you want to give memory foam a try but don’t want to spend a large amount on getting a new mattress, this topper is a great way to try it out for the first time. Although basic, with only one simple layer of memory foam, it is thick and will transform the feel of your mattress instantly. This is the perfect mattress topper for students who have arrived at their new digs only to find that the mattress in their newly rent room has seen better days. This topper won't last forever but will see you through a fair number of semesters. Some people don’t like the smell of this particular memory foam, and with no cover included, you will need to air this mattress topper out before using it; you should notice the smell begin to disappear after a couple of days. A mattress topper is only a way of improving an older or poorer mattress. Why not just replace yours entirely? Take a look at the best mattresses to help you make your decision.